Today’s Flash Back Friday comes from Episode 106, originally published in September 2012. Dr. Aubrey de Grey, a biomedical gerontologist, joins Jason Hartman on this episode to discuss how close we’re getting to finding the proverbial Fountain of Youth. Dr. de Grey explains that the aging process is simply the collection of early stages of the illusion of old age, i.e. cell damage and loss. He said the accumulation of aging side effects leads to the diseases and conditions of old age that we do not notice during younger ages. He describes the human body as a machine, albeit a very complicated and complex machine, and therefore, it should come as no surprise that the body breaks down over time. Dr. de Grey and the SENS Foundation have a plan to repair various areas of cell damage and cell loss through processes such as stem cell replacement therapies to slow the aging process. Dr. de Grey talks about the science, the research, the obstacles and the funding of this important work. He assures us that once this work is up and running, it will be the real deal allowing people to look and feel younger, but he stresses that this would be preventative care. Jason and Dr. de Grey also address the implications of slowing the aging process on the world population, the age to which people continue to work, pensions, and our carbon footprint. 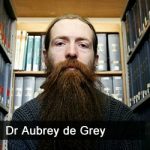 Dr. Aubrey de Grey is a biomedical gerontologist based in Cambridge, UK and Mountain View, California, USA, and is the Chief Science Officer of SENS Foundation, a California-based 501(c)(3) charity dedicated to combating the aging process. He is also Editor-in-Chief of Rejuvenation Research, the world’s highest-impact peer-reviewed journal focused on intervention in aging. He received his BA and Ph.D. from the University of Cambridge in 1985 and 2000 respectively. His original field was computer science, and he did research in the private sector for six years in the area of software verification before switching to biogerontology in the mid-1990s. His research interests encompass the characterisation of all the accumulating and eventually pathogenic molecular and cellular side-effects of metabolism (“damage”) that constitute mammalian aging and the design of interventions to repair and/or obviate that damage. He has developed a possibly comprehensive plan for such repair, termed Strategies for Engineered Negligible Senescence (SENS), which breaks aging down into seven major classes of damage and identifies detailed approaches to addressing each one. A key aspect of SENS is that it can potentially extend healthy lifespan without limit, even though these repair processes will probably never be perfect, as the repair only needs to approach perfection rapidly enough to keep the overall level of damage below pathogenic levels. Dr. de Grey has termed this required rate of improvement of repair therapies “longevity escape velocity”. Dr. de Grey is a Fellow of both the Gerontological Society of America and the American Aging Association, and sits on the editorial and scientific advisory boards of numerous journals and organizations.